Our God-given gift to co-create what we want to manifest in life begins with pure and clear Intent, coupled with a vibrational compatability with our desires. I created a Manifesting Bracelet, and Manifesting Window Jewelry, that each embody 5 gemstones that each have powerful attributes to help you manifest your desires! By wearing the bracelet or hanging the window jewelry in your window ... or even holding it in your hand ... you can feel the wonderful energy of these gemstones as you set your Intentions ... and put them into motion! 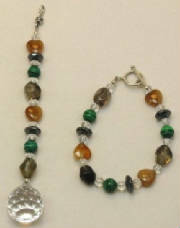 You can find these in the Manifesting Jewelry section of the Products page. Premier gemstone for the second chakra (creativity, conception...and birth...of ideas) to awaken powers of creative imagination. Stimulates the creative function or wellspring from which new potentials are born. Einstein: "imagination is more important than knowledge." So to birth or manifest an idea, we first have to think it ... then really feel it and the emotion behind already having it! Opens inner doors to increased clarity of thought, magnified powers of will, and manifesting one's creative ideas. It is important to engage our imagination! Most effective stone for grounding oneself in the body and physical world, hence ideal tool for manifesting. Counteracts feeling "spacy" and confused, helping you move forward with useful action. Balances auric field and aligns chakras. Protects from negative energies and creates positive vibrations. Strengthens your ability to take action in the world and create form from thoughts and ideas ... helping you manifest your desires and dreams. Can aid you if you have creative ideas but are unable to organize or act upon them. In unison with our Higher Selves and Spirit, reminds us that we are truly co-creators!!! Grounds and focuses us, and helps us receive insights. Has a way of drawing the ethereal into manifestation. Like the smoke of a sage bundle, the stone's energy cleanses and clears our aura and energetic systems. The most versatile and multidimensional gemstone. You can use intent to program quartz crystals to achieve goals. Amplifies your intentions, and magnifies ambient energies and spiritual awareness. Supports healing, opening of Chakras, and expansion of consciousness. Enhances meditation, dreaming, imagination, and clarity of thought. Attracts and sends love; generates prosperity.